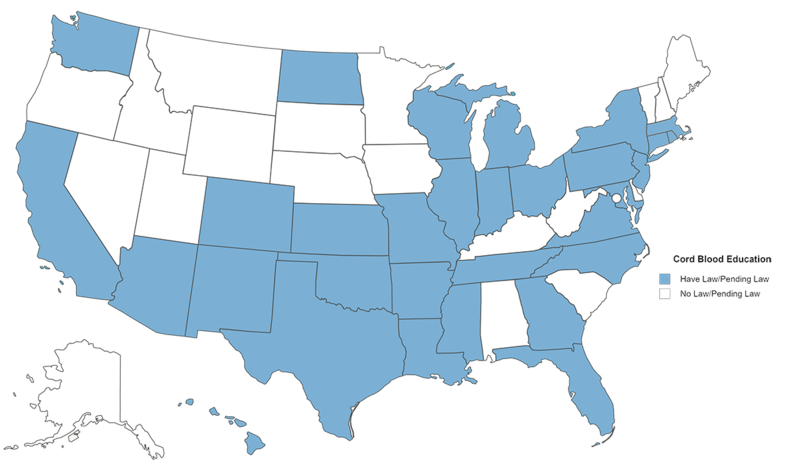 Thirty-one states in the U.S. have adopted a law or have a piece of pending legislation that requires or encourages OBGYNs to educate expecting parents about cord blood banking. Legislation mandating cord blood education took a big step forward after the Institute of Medicine (IOM) provided Congress with a report on the benefits of stems cell found in umbilical cord blood. The report called for establishing a national stem cell bank program for the collection, distribution and use of cord blood. Arizona law requires the distribution of a pamphlet that includes information regarding the collection of umbilical cord blood, its current and potential medical uses and the public and private cord blood banking options and the average cost of each. Since 2007, the pamphlet has been distributed free of charge to physicians and other health officials to educate the public and increase the amount of cord blood available for transplantation. Arizona says that since its inception, it has collected more than 5,000 public cord blood units, of which 20 have been used in transplantations. In 2007, Arkansas Governor Mike Beebe approved the Newborn Umbilical Cord Initiative Act. This act provides materials and promotes the education of cord blood banking via health care professionals. It also established the Cord Blood Bank of Arkansas, a public and private cord blood bank at the University of Arkansas for Medical Sciences (UAMS) as well as a way for people to donate directly to the cause through their tax returns. In 2006, California passed a bill to conduct the Umbilical Cord Blood Community Awareness Campaign, which provides awareness, assistance and information regarding umbilical cord blood banking options using brochures; television, print, online and radio ads; outdoor billboards and other media. It also encourages prenatal care providers to disseminate information. In 2010, California extended the bill to develop a donation program financed through a two-dollar charge on birth certificate copies. This program is also designed to target hospitals that are ethnically diverse because not all heritages are well-presented by current cord blood donors. Colorado established the Adult Stem Cell Cure Fund in 2008 to help provide funding to public blood banks and created an awareness campaign for newly expecting parents. Money for the funds come from donations made on state tax returns. The University of Colorado Cord Blood Bank (UCCBB) has stored more than 8,500 units and used more than 770 of those in transplants in the United States and abroad. Since 2007, Connecticut lawmakers have been pushing to establish a public cord blood bank. Despite a recent 2011 bill stipulating the creation of such, progress has been at a standstill. The 2011 bill would establish an umbilical cord blood collection program to "facilitate and promote the collection of units of umbilical cord blood from genetically diverse donors for public use." There has been progress in making sure pregnant women are aware of their options. In 2009, Governor Mary Jodi Rell signed a law that stipulates that health care providers give pregnant woman during the last trimester of their pregnancy timely, relevant and appropriate information regarding options to bank or donate umbilical cord blood. In 2001, Florida created the Public Cord Blood Tissue Bank consortium with the University of Florida, the University of Miami, the University of South Florida and the Mayo Clinic, Jacksonville. Its goal was to collect and to preserve cord blood tissue and give women in the state the opportunity to donate their umbilical cord blood to the public. A 2011 bill requires Florida to provide information on its website about cord blood banking and the public and private options available. It also asks health-care providers to make such information available to pregnant women before their third trimester but preferably upon their first visit. Georgia enacted a law in 2007 that established the Georgia Commission for Saving the Cure. It was known at the time as “Keone’s Law” and named after young Georgian Keone Penn, who was the first person cured of sickle cell anemia by an umbilical cord stem cell treatment, in 1998. The law gives every mother the chance to "save the cure," by being informed of all their options via their doctor during prenatal care. Such notification is required within 30 days from the beginning of the third trimester. It also called for the establishment of the Newborn Umbilical Cord Blood Bank. Hawai'i has not passed any legislation, but does have a measure requiring doctors to give expectant mothers basic information regarding umbilical cord blood donation, the benefits it offers, and the need for donors, especially ethnic minority donors. It has been deferred by Senate committees for later review. In 2006, Governor Rod R. Blagojevich signed a law requiring Illinois to provide educational materials to physicians and other health care providers about cord blood donations. It was later amended, in 2008, to require blanket information about public and private cord banking and its benefits and require providers of prenatal care to provide those materials. Another statue, in 2008, called for the establishment of a network of blood stem cell banks once appropriate funding was met. As stated in Act 315, as of July 2016 in Indiana, a person directly involved with birthing services and prenatal care is required to distribute information about postnatal fluid and postnatal tissue donation, including cord blood donations, to pregnant women. In Kansas, the Cord Blood Donation Information Act went into effect in 2007 and calls for the relaying of information by prenatal care providers during the last trimester. It also requires the health department to establish and provide materials about a mother's options. Louisiana, through the Umbilical Cord Blood Banking Program, requires providers of health care services to advise pregnant women of their options by the end of the second trimester or twenty-eighth week of pregnancy. It also established a public education program to promote cord blood awareness and the benefits of banking. In 2006, Maryland started requiring hospitals and obstetricians to distribute educational materials concerning the donation of umbilical cord blood. Currently, there are no public cord blood banks in Maryland, so it is the duty of the parents to research their options about donating to a bank in another state. In Massachusetts as of 2005, all licensed hospitals must inform pregnant women of the option of donating their cord blood no later than 30 days from the beginning of their third trimester. The Act Enhancing Regenerative Medicine in the Commonwealth also requires, upon appropriate funding, the University of Massachusetts Medical School (Worcester) to establish and maintain a public cord bank. In addition, the Department of Public Health asks doctors to educate expectant parents about cord blood banking. In 2007, legislators in Michigan called on the state's health department to establish a network of cord blood stem cell banks in the state upon meeting funding needs. It also asked the department to provide educational material on the uses, benefits and storage options of cord blood stem cells and to encourage health care professionals to provide information before the third trimester. In 2014, Mississippi passed the Umbilical Cord Blood Banking Program Act, which established the Umbilical Cord Blood Banking Awareness Program. It is responsible for the development of educational materials to promote cord blood awareness through various outlets including professionals in the health-care field. In 2005, Missouri established eligibility criteria for awarding grants to public umbilical cord banks. In 2011, it tasked the Department of Health and Senior Services to provide information about cord blood stem cells and public and private banking options. It also encouraged obstetricians or gynecologists to provide that information to pregnant women. In 2005, Governor Richard Codey of New Jersey used executive orders to establish the development of educational materials pertaining to the values of cord blood banking and the creation of a statewide public cord bank, which later became the New Jersey Cord Blood Bank. It is considered the first statewide publicly funded umbilical cord blood bank. In 2007, legislature was enacted that requires hospitals to inform patients known to be pregnant of the option to donate their cord blood. In 2008, the state passed cord blood legislation aimed at educating expectant families on ALL their cord blood preservation options. New Mexico added legislation in 2005 that requires physicians to educate expectant parents about public donation of cord blood. It also creates a written publication to be distributed to physicians that discusses the process and benefits of public banking. New York enacted in 2007 requirements for physicians to educate expectant mothers about their cord blood banking options. This requirement was later repealed. Currently, there are a number of pieces of legislation around cord blood banking that have been referred to the state's health committee. These include the creation of a public umbilical cord blood banking program and the development of educational and other materials for the promotion of private and public cord blood banking or just public cord banking. North Carolina Governor Beverly Perdue signed into law in 2009 a bill that requires the creation of free educational materials about cord blood banking to be provided by the North Carolina Department of Health and to be made available to doctors and patients. It also encourages doctors to speak to pregnant women about their cord blood banking options early in the pregnancy. In 2011, Jack Dalrymple, governor of North Dakota, signed a law that directs the state's health department to provide a pamphalet that talks abut the cord blood banking options. It also tells doctors that they may inform pregnant patients about thier cord blood banking options. In 2009, Ohio Bill 102 was signed into law and requires the Ohio Department of Health to provide printable publications to doctors about cord blood banking and asks those doctors to provide a copy of that publication to pregnant women prior to their third trimester. Oklahoma started to research umbilical cord blood banking in 2004, when it enacted the Danielle Martinez Act. It was named after a seven-year-old who passed in 1995 because of complications with a bone-marrow transplant while undergoing treatments for leukemia. The act set up a committee that would last until 2007 and advise legislators on how to address umbilical cord stem cells. Following the committee's recommendation, in 2009, Bill 3060 was signed into law by Oklahoma Governor Brad Henry. The measure requires the Oklahoma State Department of Health to create a public cord blood bank when it met its funding needs through a combination of public money and private donations. It also mandates that the state's health department provide sufficient information to expectant mothers about their private and public cord blood banking options and requires doctors to inform them of their options in a timely manner. HB 874, known as the Umbilical Cord Blood Education and Donation Act, was enacted in 2008 and requires health care providers to inform pregnant women of their cord blood banking options by the end of their second trimester. It also requires the Department of Health of the Commonwealth to make available sufficient, printable information about cord blood and cord blood banking options via its web site. The Umbilical Cord Blood Donation Notification Act added into law in 2008 requires obstetrical professionals or facilities to notify the patient of the benefits of stem cells and her cord blood banking options in a reasonable amount of time after the end of her first trimester. In 2006, Tennessee legislators mandated information about cord blood donations be provided to expectant mothers. In 2010, it amended that legislation to encourage principle health care professionals related to the women's pregnancy to discuss all of her cord blood banking options by the end of the second trimester. It also directed the state's health department to create printable materials designed to help expectant mothers make informed decisions. In 2001, Texas Bill 3572 established a grant program to be run by the Health and Human Services Commission (HHSC) for public cord blood banking in the state. In 2007, Governor Rick Perry signed HB709 into the Texas's Health and Safety Code, which requires the development of a brochure that goes over cord blood's benefits and banking options. It also states, "a physician or other person permitted by law to attend a pregnant woman during gestation or at delivery of an infant shall provide the woman with the brochure described in Section 162.018 before the third trimester of the woman's pregnancy or as soon as reasonably feasible." The Virginia Cord Blood Bank Initiative was signed into law in 2006 and establishes a cord blood institute for the collection, screening, cryopreservation and storage of umbilical cord blood as a public resource. It also called for the dissemination of cord blood information to doctors and other practitioners and encouragement of them to provide the information to any expectant parents. It was followed in 2010 by a requirement that the Virginia Department of Health provide resources related to cord blood banking options on its website. Taking effect in 2010, Washington state requires providers of prenatal care to provide information about the benefits of stem cells and the public and private cord banking options. Governor Jim Doyle signed Assembly Bill 270 into law in 2005, which required prenatal health care providers to inform women by their 35th week of pregnancy of the option to donate to a public cord blood bank.